Situated in the 16th arrondissement, not far from Porte Maillot, this classic French townhouse is hidden in a private and prestigious Parisian cul-de-sac along Villa Dupont. Behind its wrought iron gates, the residence is surrounded by an enchanting garden, complete with a pond, stone pathways and patio furniture. Is this Paris? Upon entering, you will find a large salon, traditionally furnished, with an adjoining library and office. Descend the winding staircase and find the fully-equipped kitchen, with backyard access, and dining room fit for a large reception. Take to the staircase again and discover three charming bedrooms—perfect for children and guests—and a large bathroom. Continue up the staircase and find the spacious master suite with an adjoining salon and walk-in closet, naturally lit with floor-to-ceiling windows, and a master bathroom. The hôtel particulier also features a laundry room, two exterior storage rooms, and parking. In a stylish building, quiet, this furnished, quiet duplex apartment includes 3 bedrooms, 2 bathrooms and two toilets, with entrance on the 6th floor elevator + stairs to access 7th floor. The rooms are spacious, bright, with a large open kitchen, modern furniture, air conditioning, quality neighborhood, kitchen side terrace with beautiful views of the Pantheon and Observatory. Internet is installed and included. Double glazing assures good heating. A concierge watches over the building. This splendid apartment is located not far from the Jardin de l'Observatoire of Paris, Square Jacques-Antoine and Square Claude-Nicolas-Ledoux where, in less than 5 minutes walk from the accommodation, it is possible to regenerate oneself. The Paris Observatory, the Paris Institute of Astrophysics, the Cartier Foundation for Contemporary Art, the Cochin Institute and the Giacometti Institute are the exclusive places surrounding the apartment. Finally, the legendary Père Lachaise Cemetery hosting the writer Oscar Wilde, the singer Jim Morrison, the fabulist Jean de la Fontaine, the actress Sarah Bernhardt, ..... and, most recently, the great musician and composer Michel Legrand , welcomes you for a moment of meditative solitude and beauty. The "Denfert Rochereau" station provides access to the RER and metro line 6. Also, there are buses for the airports. 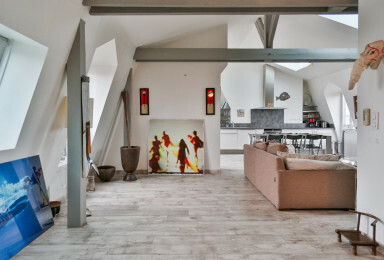 In a beautiful, historic building on the Ile de la Cité, this prestige furnished apartment offers an exceptional view on the Seine. Featuring two full bedrooms and bathrooms, there is also an additional room that can serve as an office or a third bedroom. With classic furnishings and neutral colors throughout, the spacious living room features a dining area, and the modern kitchen and bathrooms have been completely renovated. 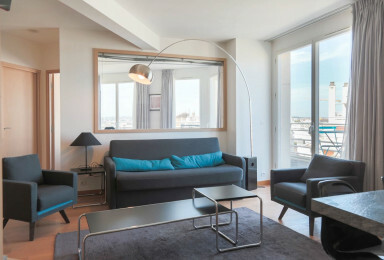 This luxury flat allows you to wake up and gaze across a quintessential view of Paris. This elegant furnished 2 bedroom, 1 bathroom apartment offers a magnificent view of the Invalides and of the Dome where Napoleon lies. Bathed in light, contemporary furnished, with Internet installed and included in the rent, this apartment enjoys a location of choice in the heart of the prestigious 7th district of Paris. The Army Museum is 400m from the accommodation. Diplomats can be in less than 3 minutes at the Consulate General of Chile, and at the National Assembly in less than 15 minutes by foot. The Ecole Supérieure du Digital is 3 minutes away and the International Bilingual School - The American University of Paris - is less than 400 meters from the residence. From the Quai d'Orsay, 15 minutes away, the banks of the Seine offer a beautiful promenade or a sport course. Behind the Invalides, the Musée Rodin with Rodin's legendary sculpture and the famous "Portes de l'enfer" opens its bucolic garden where it is good to walk or have coffee at Café Rodin for a gourmet break. The place is well served thanks to the stops "Tour-Maubourg" & "Varenne", with the lines 8 and 13 of the metro Parisien. Perfect to unwind after a hard day, a delightful paved and green entry leads to the staircase where two walk-up floors later one comes in a furnished apartment with 2 bedrooms, 2 bathrooms and 3 toilets. With modern and chic furnishings and natural light thanks to a bay window, the apartment offers a magnificent view on the Cupola sheltering Napoleon’s Tomb. The kitchen is spacious, the bathrooms are functional, and it is possible to isolate yourself on the mezzanine where a desk allows one to work or study quietly. Comfort assured. 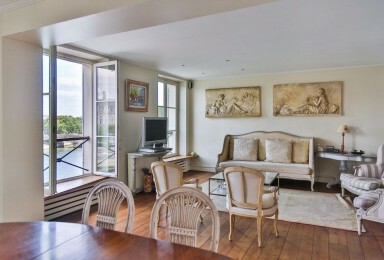 Only a fifteen minute walk from the Esplanade des Invalides, this apartment enjoys a prime location in the heart of the prestigious 7th district of Paris, not far from the Hotel des Invalides and the Army Museum. Diplomats can get to the Consulate General of Chile in 3 minutes, and to the National Assembly in 15 minutes walk. For students, the Digital Ecole Supérieure is just minutes away and the International Bilingual School -American University of Paris- is only 400 meters away. The Quai d'Orsay offers a refreshing and sporty walk along the banks of the Seine, with cafes and restaurants, sport courses all year -7km, between the Place de la Bastille and the Eiffel Tower. Admire Rodin's Portes de l'Enfer at the Musée Rodin where the legendary Sculpture of the artist has the place of honor in its elegant garden. Have a stroll and why not a charming lunch at Café Rodin located in the heart of the garden in the 7th arrondissement of Paris. The location is very well served by the stops "Ecole Militaire", "Ségur" & "St-François-Xavier", on lines 8, 10 and 13 of the Paris metro. Welcome ! 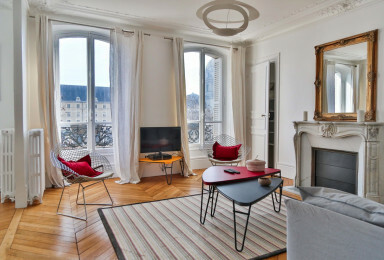 On Avenue Paul Doumer, just down the street from the Trocadéro in the 16th district, this completely renovated and bright 1 bed, 1 bath apartment is far from typical. With its contemporary style—a Castiglioni Arco floor lamp, Eames chairs, a Rietveld Zig Zag chair, light oak parquet and paneling throughout—this apartment has a classic modern feel that a trendsetter dreams of plus all the functionality of a modern apartment, completely equipped with plenty of closet space. Internet, cable, and telephone (Tripleplay) are already intstalled. With large windows that open onto a terrace extending across the front side of the apartment, you can relax on the patio furniture while gazing across the rooftops of Northwestern Paris. Certainly a breathtaking view from a luxurious, modern space! The building, built in the 1950s, features collective heating and hot water, and basement space. Concierge and video interphone ensure your security. Parking is available nearby.